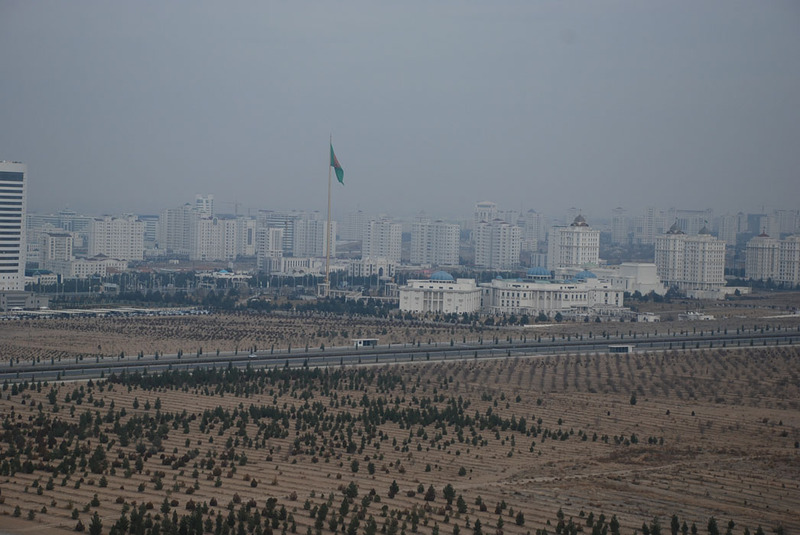 Transit trips around Turkmenistan. These options based on experience of travel requests. The programs are flexible and number of days or itineraries can be changed as per traveler requirements or planning. Any hotel or guest house in Turkmenistan, it can be changed as per request. Camping in desert is ok.
Pls. kindly note that visa consular fee (cost depends on place to obtain), tax at border (12 USD p/p, paid once), entrance fees at sites, photo/video fees, guide service, meals B L D, gratuities, personal items, any other services missing above – NOT included into quotes. Thank you. Arrive at the border. Formalities. Drive to Kunya Urgench historical site (“Kunya Urgench” contains the survived monuments: mausoleums of Il Arslan 12th century, Sultan Tekesh 12th century, Turebeck Khanym 14th century, Najm addin Cubra 14th and Sultan Ali 16th century, minaret of Kutluk Timur 14th century (probably started in 11th ) 62 meters high, the tallest old brick construction in central Asia. The capital of Khwarezm had the most power in 11th – 13th centuries, have been overcoming in population and fame other Silk Road cities of central Asia. In 1221 it was razed by Genghis Khan, on its way in central Asia. After the revival in 14th century, the city was left forever due to Amudarya river course change and new destruction this time by Timur in 1370, later the new town of Urgench was built in present day Uzbekistan. Since 2005, it become a world heritage site protected by UNESCO. Sightseeing and continue drive to Darvaza. Arrive. Venture in the desert and arrive at Fire gas crater. Camping. Enjoy the view of the gas crater at night. O/N in tent. Return on the road. Continue exploration of gas craters along the route. Drive to Ashgabat. Stop for photos at Yerbent village along the road. Drive to Merv historical site (One of the famous cities on the ancient Silk Road, having more 2500 years of history, declared a World heritage site from 1999. It is located 26 km to the east from Mary, the first ruins appeared on the outskirts of Bayram Ali town. Its immense domain enclose five main sites (Erk Kala, Gyaur Kala, Sultan Kala, Abdullah Khan Kala, Bayram Ali Khan Kala) and numerous remains of caravanserais, fortresses, fortified castles and small towns or estates now seen in the forms of mounds, total surface is around 70 sq. km. As Gonur, the Merv in its turn had appeared, thanks to the Murgab river, flowing in the area in ancient times. Silk Road important city, Merv had four directions of trade caravan routes: Kunya Urgench to its north, Bukhara and Samarkand (Sogdiana) to the east, Herat (Bactria) to the south, to Mashad (Iran) to the west. Sightseeing: Alexandria Margiana (Erk Kala), Antiochia Margiana (Gyaur Kala) remains, Sultan Kala, Sultan Ahmad Sanjar mausoleum, Yusuf Hamadany shrine, Mohammed ibn Zaid mausoleum, Gyz Kala castles. Return in Mary. Check in htl. Afternoon visits to choice: Mary history museum or Talkhatan Baba pilgrimage (XI c mausoleum/ Seljuk architecture) & Ahun Baba madrassah remains XIX c. O/N at htl. Pls. kindly note that visa consular fee (cost depends on place to obtain), tax at border (12 USD p/p, paid once), entrance fees at sites, photo/video fees, guide service, meals L D, gratuities, personal items, any other services missing above – NOT included into quotes. Thank you. At 09:00 a.m Meet at Farap border. Drive to Merv historical site (One of the famous cities on the ancient Silk Road, having more 2500 years of history, declared a World heritage site from 1999. It is located 26 km to the east from Mary, the first ruins appeared on the outskirts of Bayram Ali town. Its immense domain enclose five main sites (Erk Kala, Gyaur Kala, Sultan Kala, Abdullah Khan Kala, Bayram Ali Khan Kala) and numerous remains of caravanserais, fortresses, fortified castles and small towns or estates now seen in the forms of mounds, total surface is around 70 sq. km. As Gonur, the Merv in its turn had appeared, thanks to the Murgab river, flowing in the area in ancient times. Silk Road important city, Merv had four directions of trade caravan routes: Kunya Urgench to its north, Bukhara and Samarkand (Sogdiana) to the east, Herat (Bactria) to the south, to Mashad (Iran) to the west. Sightseeing: Alexandria Margiana, Antiochia Margiana remains, Sultan Kala, Sultan Ahmad Sanjar mausoleum, Yusuf Hamadany shrine, Mohammed ibn Zaid mausoleum, Gyz Kala castles. Return in Mary. Check in htl. O/N at htl. At 08:40 a.m Flight to Ashgabat. Visit Tolkuchka bazaar. Sightseeing in Ashgabat. Visit the parks and squares of the capital, Ertogrul Ghazi mosque, the archeological site “Nisa” (The ruins have mud brick remains of fortifications and palaces, temples, ceremony hall, treasury building. It covers the remains of Parthian civilization, what combined the traditional art and culture with Hellenistic and Roman elements. The richly decorated architecture of religious, royal power and ordinary domestic functions had been revealed as the result of archeological excavations, started from beginning of 20th century and are continued in our days. Nisa or Parthaunisa presumed to be the first capital of Parthians, its ancient people lived along Kopet Dag mountain range (modern Turkmenistan and Iran). Accordingly to UNESCO description, Nisa played important role of a barrier to Roman Empire expansion to the west, while playing the communication and trading centre between east and west, between central Asia and Mediterranean cultures. Discover Turkmenbashy spiritual mosque in Kipchak. Return in Ashgabat. O/N at hotel. *if you are interested, we can offer complimentary drive after sunset to high point of town for panoramic photos of Ashgabat at night. Pls. kindly note that visa consular fee (cost depends on place to obtain), tax at border (12 USD p/p, paid once), entrance tickets to sites, photo/video fees, guide services, meals L D, gratuities, personal items, any other services missing above – NOT included into quotes. Thank you. Pls. kindly note that visa consular fee (cost depends on place to obtain), tax at border (12 USD p/p, paid once), entrance tickets to sites, photo/video fees, guide services, meals B L D (except breakfast in Turkmenbashy htl), gratuities, personal items, any other services missing above – NOT included into quotes. Thank you. Start drive to Darvaza gas crater. Arrive and start to visit the gas craters along the route. Then drive in desert to see fire gas crater. Stay in the desert for overnight. Camping in the area. O/N in tents.